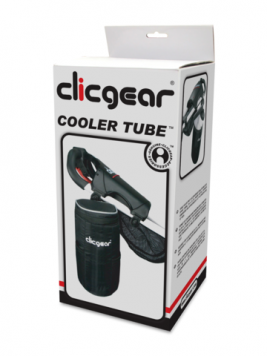 Made from waterproof nylon, it is insulated and lined to keep your drinks colder. Easily holds two 12 oz. beverage cans, or one 20 oz. sport drink, or a 32 oz. water bottle. Interior dimensions are approximately 4.5″ in diameter and 10″ high. Fits all Clicgear® and Rovic® Brand Carts and will also fit other brand name push carts with 1″ tubing. This accessory comes with (1) Clicgear Accessory Tab Mount for easy mounting.